As a leading platform for increased productivity and collaboration, Evernote knows there is value in streamlining communication between professionals and the software that powers their businesses. That’s why the SaaS company invested in a dedicated Twitter support handle: @EvernoteHelps. “Our objective with @EvernoteHelps is to support every user that comes through our doors,” said Geoff Barry, Support Scaling and Care Tools Manager at Evernote. Executing a social customer care strategy with the goal of 100% engagement is no easy task. Evernote faced one primary challenge: scaling. To reach its objective, the team of six turned to Sprout Social’s Twitter automation features. The sensitive nature of customer care requires that Evernote’s support team has a consistent strategy and workflow for how it should assist people publicly and when it should transition Twitter conversations to DMs. Sprout’s Twitter automation features enable Evernote to guide customers into DM and prompt the initial, often repetitive task of fielding what the inquiry is about. When a person visits @EvernoteHelps and clicks on the DM button, a chatbot greets him or her and triggers four Quick Reply options. With a single tap, the customer selects the reply option that best matches the subject matter of inquiry. This interaction is routed through Sprout’s Smart Inbox, where the support agent is able to jump into an informed conversation that’s already in progress. 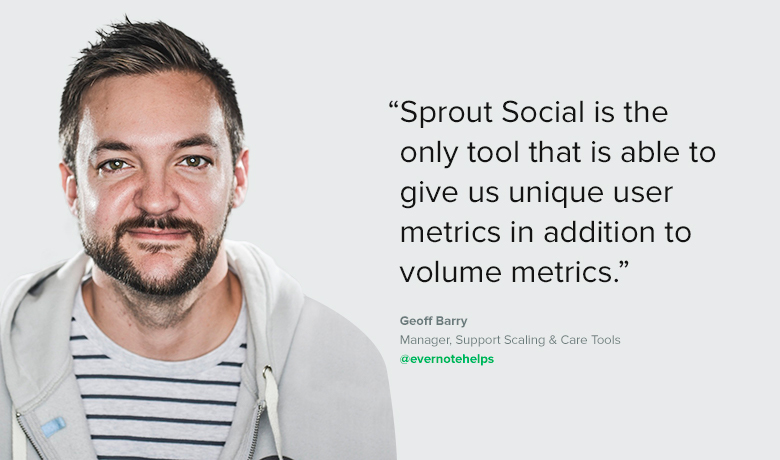 Sprout’s social customer care tools enable Evernote to help more people per agent in less time. Since the brand launched Sprout’s Twitter automation features, the support team has seen an 18% decrease in replies sent per conversation. The team’s customer care efforts have also resulted in an 80% increase in people helped on the platform per week, compared to its other channels. While Sprout’s Twitter automation features are helping drive ROI, the platform’s Group Report is providing Barry and his team with the unique user metrics they need to report on to senior leadership. “Sprout Social gives us unique user metrics in addition to volume metrics. Simply put, how many people did we help?” said Barry. Custom reporting enables Evernote to dig deeper and identify patterns among those interacting with Sprout’s chatbot features. Volume analytics help the team track the amount of people who are reaching out about a selected topic. These metrics inform the team’s social strategy and help influence content creation and broader marketing initiatives. Automating the initial process of collecting pertinent information provides Evernote support agents with the context they need to quickly resolve problems—efforts that directly impact the company’s focus on engaging with more individuals.